Through the targeted use of a wide set of immigration and law enforcement policies and actions, the U.S. government has cast Muslims as dangerous threats to national security, leaving Muslim communities across the United States vulnerable to discrimination and discriminatory profiling. 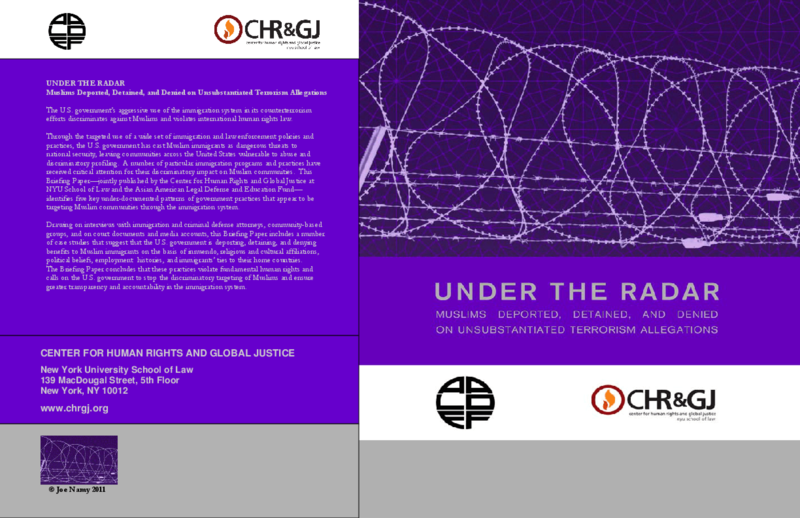 This Briefing Paper by the Center for Human Rights and Global Justice (CHRGJ) and the Asian American Legal Defense and Education Fund (AALDEF) documents the U.S. government's deployment of lower evidentiary standards and lack of due process guarantees in the immigration system against Muslims to further marginalize this targeted group in the name of national security and counterterrorism. A number of particular immigration programs and practices -- such as the National Security Entry-Exit Registration System (NSEERS),the Federal Bureau of Investigation (FBI) name-check system in the naturalization process, and racial profiling at U.S. borders have received critical attention for their discriminatory impacts on Muslim communities. This Briefing Paper draws on interviews with immigration and criminal defense attorneys and community-based groups, court documents, and media accounts to identify five key under-documented patterns of government practices that appear to be targeting Muslim communities through the immigration system. Copyright 2011 NYU School of Law Center for Human Rights and Global Justice, Asian American Legal Defense and Education Fund.